I like to ride aerobars facing slightly upwards. 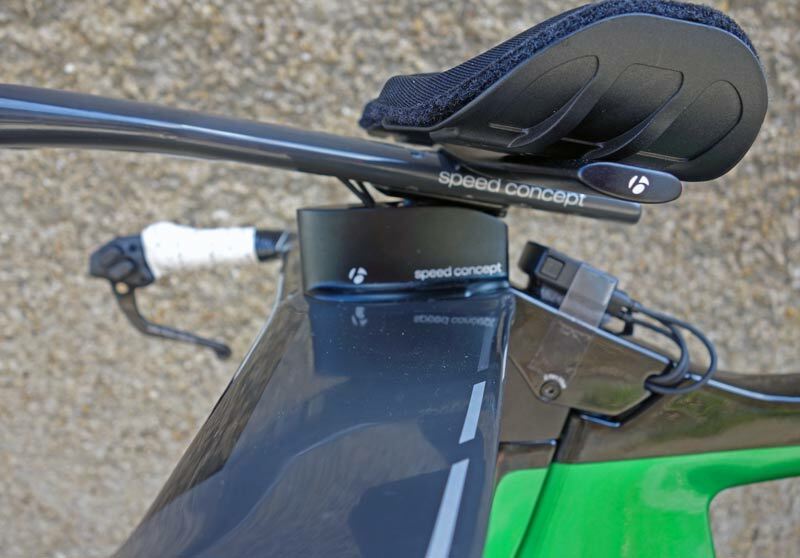 The Speed concept bars allow a small degree of angle. I would like more, but this is about as far as it will go. 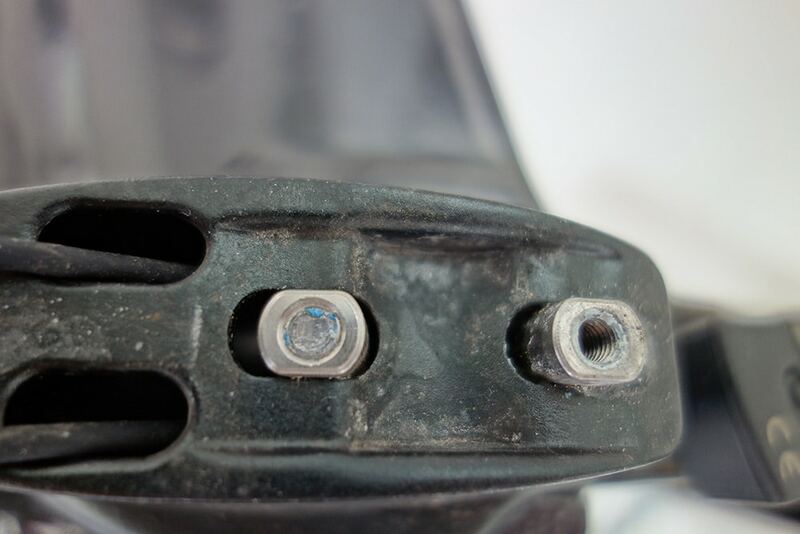 However, when keeping aerobars at this angle, seems to place great stress on one of the bolts. Over time the bolt shears and breaks off. This happened last year and I put it down to a bad angle of set up. After getting a replacement bolt set, I took great care to place the bolt into the bracket at the right angle (not stressing it). It was very difficult to tighten this bolt as you have to hold the nut from underneath and then screw down. It’s one of those jobs, where you could do with a third pair of hands. Unfortunately, I had same experience today, about 12 months after last aerobar failure. Again the bolt sheared away, leaving just one bolt holding everything in place. (at bottom, featured below). Of course, the aerobars come loose and wobbly. I was 40 miles from home, but at least it wasn’t in a race. Once might have been bad luck or poor set up. But, the second time around I tried everything to tighten up correctly. To happen a second time is a real problem. Also, I know it has happened to other riders. Thanks for people who leave comments sharing their experience with the bolts shearing off. It shows it is a widespread problem and not just due to inadequate set up. Also, it seems that Trek’s response is inadequate, with no-one able to get a satisfactory solution. Trek just seem to try and fob riders off. “What I believe could have happened is where you have adjusted the tilt of the bar, you have bottomed out the set screw on the top cradle, if this occurs, the force is put onto one bolt rather than spread between the two. please also make sure the bolts are not being over tightened, all torque settings can be found in your speed concept user manual. “Tightening the bottom bolt (closest to you when sitting) first. This should angle the bars all the way up. THEN tighten the other both (what looks like the broken one). Try replacing the bolts with ordinary (but good quality) non-stainless ones. Assuming they are stainless steel bolts, they will be inherently weaker than non-stainless, hardened steel ones. Not to my satisfaction. I never know how long they are going to last. I had this exact issue occur last weekend. Do you have a part number for the replacement bolts and T nuts? sorry no. Trek were not particularly helpful when I enquired. Last summer I ordered a whole replacement set of nuts and bolts, but it never arrived. Does anybody have an update on the top cradle bolts snapping? Mine have snapped/sheared 4 times. Each time, they have been replaced with the Trek replacement bolts and torqued to spec. I do not live near a Trek dealer so having trouble getting any useful information about this. Thanks. Hello – I recently had this same issue occur during an Ironman event. I fortunately was not hurt/did not wreck as we approached speeds of over 50mph on the downhills but it did cause me to ride aero-less for a little less than half the distance. The design is on a very high shear point and the bolt’s flat out are failing as they are what i suspect the inappropriate grade for the tensile force applied. The bike is currently at my LBS and I am waiting to hear back the manufacture – if they simply replace the assembly with the same material I will conduct the proper testing to see what replacement hardware is needed to survive in this environment. Hello, thanks for the reply. I have just had my 6th bolt shear and am beyond frustrated. If you have Found a good solution, kindly share here. I am at the point where I no longer feel safe on this bike. Thanks! The manufacture replaced the entire assembly kit with the same bolt and T anchors. I am doing my own testing at this point on the bike as the original assembly was performed at the Trek dealership and not myself. I have completely disassembled and reassembled the system with the new provided anchors and bolts with Trek recommended specifications and locktite. If the bolt fails again I will than look further into a different clamping system and bolt material (IMO its a matter of when not “if”). When designing the bolt and anchor they ovalized the allen bolts to act as a pivot based on where the base bar is set and Anchor angle. The shear rate I can only assume is so low as Trek has quite the warranty on Carbon Fiber components and with components such as this I only assume they designed a bolt to fail before a mono extension carbon failure. When speaking directly to Trek the simple answer given was it was an isolated case and unsure of the exact failure. This is a very dangerous situation IMO and I am not 100% certain that a off the shelf bolt can appropriately work to solve the issue. My bolts sheered off last Saturday while I was riding at 26mph. Luckily I only suffered a crushed helmet and fractured scapula. This sounds like an on-going problem for sure. My rear bolt sheared off on a downhill, 30 mph at Ironman Hawaii 2017. I keep my bars level to 1 degree upward tilt which probably increases the stress on the rear bolt, especially downhill with more weight on the front end. I hit a small transverse seam in the road and bang. The aerobar pitched forward and swivelled side to side. Nearlly crashed. Bike in the shop now. Larry – sorry to hear this. I also suffered the same failure during Kona 17 which resulted in a DNF and a broken hand. Glad to hear you did not crash..! I had the same problem last Saturday….Has anyone found a solution for this issue? I may have found a solution, but like all of you have conveyed only time will tell.Hang in there with me as i describe what i have done… I have taken off the screw closest to you (the rider), and added a spacer so that the handle bars lay flat, and eliminate the angle that is the root of this design flaw. So far it has accomplished two things. First, it allows us to be in a more aero position, and secondly it eliminates the stress put on the screw due to the incorrect angle. Again only time will tell if this will really work, but as my buddy(an engineer) and I evaluated it, this may be the ticket. Kind of a bummer that we have to collaborate like this given the bike we all own, but i don’t like reading about fellow triathletes getting injured, and possibly hurt much worse. Wishing all of you a safe ride. Hope this helps. I had the same failure. It was in a race but fortunately I stayed upright. I have the bars angled upwards but I don’t really understand why this overstresses that bolt or what I can do about it. I’m about to switch over to the alternative aerobar setup (at great expense) which allows you to use generic poles and, therefore get far more upward adjustment. Will this fix the problem? I‘ve had the same problem with my new Trek speedconcept during an ironman in Vichy (France) 8/2018. The aerobar untightens by itselfs after 25 Miles und i couldn‘t use the aeroposition during the race!!! I‘ll bring it to my bikedealer next week. I don’t believe there’s a fix for this common issue of the bolts shearing. Mine broke at 32 mph going downhill and I was amazed I didn’t crash. As I wheeled my broken bike into the Trek store a woman was bringing hers in with the same broken bolts!! Mine had been serviced by experienced techs at a Trek store and was only one year old. Do a Google search and you’ll find numerous examples. Not sure what to do about this with an expensive bike I like otherwise (except for the rear brake sticking). I’m sure other companies have had a product recall for less.